WHAT IS MY ZODIAC SIGN IF I WAS BORN IN MARCH MONTH ? "What my sign if i was born into the world a day of March ? If you are born in March what zodiac sign are you ?" If you were born any day of the third month of the year and then March what zodiac sign you belong between aries, taurus, gemini, cancer, leo, virgo, libra, scorpio, sagittarius, capricorn, aquarius, pisces ? If you were born in the month of March of any year of that zodiac sign are you then ? Let's figure it out today for free and online on Oroscopodioggiedomani.it. Let's say that if you were born between March 1 and day 20 including of the month, you are in the sign of pisces. If you were born in one of the days 21, 22, 23, 24, 25, 26, 27, 28, 29, 30, 31 on March then your sign is aries. Under it you can see two tables that show how the astrological calendar is divided on the basis of the beginning and end of a sign. The zodiac signs are 12 and then you can read how someone born in March can be the sign of pisces or aries. Please note that who was born on March 20 might also be aries according to your time of birth. For this reason it is best to calculate your natal chart accurately and find out the exact degree falls on the Sun (which tells us we belong to that sign). You can calculate your natal chart free online in this page. Then come back here and read the characteristics of your sign. You can also find your ascendant, you will discover your chinese sign, mayan sign, celtic sign and read the general horoscopes relating to day, week, month and new year. You can also discover what day of the week you were born. Meanwhile, here in the two tables that show the days on which the period begins and ends each of the 12 signs of the traditional zodiac. The second also indicates if the sign is fixed, cardinal, mobileand to that element in nature belongs and so fire, earth, air, water. Below you can choose your month of birth and select from the dropdown list that opens your day of birth. You will go to the page of your birth day to figure out which sign you belong to. 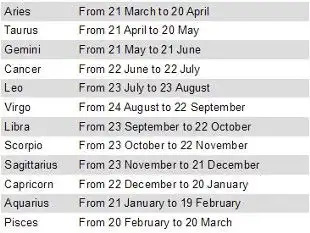 Below you still find a table that shows the days on which the period begins and ends each of the 12 signs of the traditional zodiac.